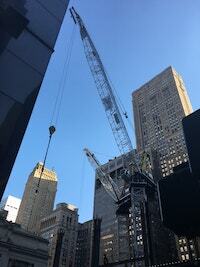 In New York, crane accidents account for numerous injuries and deaths each year. These accidents result from negligent and careless use of cranes as a result of inadequate supervision at construction sites as well as negligent crane design by the product manufacturer and failure to properly warn of hazards known to the manufacturer. The New York Crane Accident Lawyers at Gair, Gair, Conason, Rubinowitz, Bloom, Hershenhorn, Steigman and Mackauf are among the most sought after for their legal expertise in the field of Construction Accident and Labor Law. They have helped numerous victims of crane accident and their family to recover proper compensation for their damages and loss. Recently our attorneys obtained a $10 million settlement for a woman who suffered serious injury after a crane fell on her leg at a construction site in New York. If training included a thorough review of the operating characteristics of the crane, its limitations, and the hazards involved in both proper and improper usage. If crane operators and maintenance personnel were adequately supervised and directed. If the crane manufacturer provided clear warnings as to the dangers inherent in the operation of the crane and to design the crane so as to avoid, as much as possible, injury or death from known hazards. If the crane was appropriately maintained by the crane owner. If there was a written policy requiring regular inspection and the immediate reporting of defects for prompt corrective action. If the manufacturer's specifications for maintenance and inspection were followed. If the hoisting equipment was be inspected daily, prior to operations. If the inspections of cables, sheaves, pulleys, boom, and boom stops were conducted on a regular basis. Many mobile crane accidents occurred when a load is too heavy. Loads should not be lifted which exceed the rated capacity of the crane. Miscommunication between workers. Standard operating signals should be agreed upon and used to direct all crane operations. One person should be designated to give signals to the crane operator unless the load is being transferred to a point which is out of sight of the signalman. In such cases a second signalman should be used. Inappropriate installation and inappropriate use of equipment. When mobile cranes are being operated on soft ground, substantial mats should be laid down. Slings must be adequate for the load being lifted. The foreman should determine that the proper sling is being used and that it is correctly applied before a lift is made. Taglines or guide ropes should be used on loads that may swing or must be guided through a restricted space. They should be handled under the direction of a master rigger. Precautions should be taken to guard against injury to workmen, structures, or scaffolds from swinging loads. The crane hook should be directly over the load being lifted in order to minimize strain on the crane and sliding of the load. A shackle or closed hook should be utilized when using swinging buckets. If a bucket strikes an obstruction it may be dislodged from an open hook. One of the most serious hazards in crane operation is contact with electrical power lines. A minimum distance of six feet should be maintained between the boom and power lines. If possible, all interfering wires should be relocated during construction. It should never be assumed that a power line taken out of service is de-energized as it may be inadvertently switched back on at any time. When a crane must work under power lines the installation of a safety guard should be employed. If an energized power line is contacted by a crane boom, the operator should stay with the crane until the boom is cleared. Power should be cut off and all controls locked before the Operator leaves the crane cab. Where practical, the boom should be lowered to the ground when leaving the crane at a construction site over night. Climbing Cranes. When climbing within a building, using its climbing frames and hydraulic climbing mechanism, the crane's lifting height is limited only by the height of the building. As the building goes up, climbing frames are brought up to the new stories, and the crane can continue to climb. Prior to its installation within a building, the basic unit can be used as a static mounted crane for the first stage of the project. The floors of the building should be designed to support this added load. Stationary Cranes. If the building or application does not permit the use of a crane within it, the crane's outer tower can be mounted freestanding on a base mount or concrete footing. No alteration or extra work is necessary. The crane can then use its own climbing mechanism within the outer tower. Additional outer sections are added as needed to allow the crane additional lift height. Traveling Cranes. The addition of a rail mounted under carriage to the stationary crane allows free traveling under load on either straight or curved tracks. Tower cranes may also be mounted on rubber tires and crawlers. The foundations for all types of tower cranes are installed by the contractor. The tower crane manufacturer provides the design and all of the basic information about the tower crane, such as vertical loads, horizontal loads, swing moments and overturning moments, from which the contractor's structural engineers can design the required foundation by considering the added variables of the ground conditions at the proposed construction site. For static tower cranes the foundation consists of one large reinforced concrete mass. For climbing tower cranes two types of support are required. The initial installation will have to be supported by a reinforced concrete foundation similar to, but smaller than, a static tower crane. The second type of support is that which must be incorporated into the design of the floor slabs during the initial design of the building. For traveling tower cranes the supporting surface must be solid and capable of maintaining the tower in an essentially vertical position consistent with the manufacturer's requirements to prevent overturning. Many safety controls are required on Tower Cranes. These include limit switches on all possible movements; dead man controls on all control boxes, warning lights and buzzers to warn the operator when overload conditions are being approached and automatic acceleration and deceleration controls on the load line and jib swing controls. The manufacturer is responsible for the specifications covering: foundation requirements, counterweight and ballast requirements, erection sequence, bolting sequence, type and size of bolts and lock nuts and operating procedures. The manufacturer must provide instruction manuals and inspection logs for cranes used in the United States, which should be printed in English. Before a tower crane is installed, the contractor should review the proposed site for obstructions to the free swing of the load. He should consider: nearby buildings, electric lines, telephone lines, pipe lines, supporting poles, and public streets. If two or more tower cranes are to be installed at the same job site or at adjacent job sites by different contractors, the tower cranes should be installed with the jibs at different elevations if their radii overlap. This requires coordination by the contractors and their respective operators. There should be an access ladder installed inside the tower. There should be landing platforms at least every 30 feet. The ladder may be equipped with a cage. The main power cable to the tower crane should be protected from damage. The main power switch should be capable of being padlocked in the 'off" position. All electrical components and the tower crane structure must be grounded. Operating controls in the cab and on the remote control box must be labeled in English. All tower cranes should have automatic stops on all movements in case of a power failure. Remote control boxes should be weatherproof. Weights must be securely fastened in place. Additional safety chains or cables are required for back-up protection. The crane cab should be constructed of fire resistant material, be completely enclosed for weather protection, have a door for safe access to the ladder, provide maximum visibility, adequate heat and ventilation, a fire extinguisher, interior lights, and an intercom system and have no material or flammable liquids stored in the cab. The basic safe practices for rigging any load also apply to tower cranes (hooks, slings, chokers, shackles, wire rope, etc.). Tag lines should be used where necessary to control the load. All inspection and maintenance procedures, frequencies, and sequences must follow the manufacturer's specifications. A full test of all functions should be made after erection or extension and before the tower crane is approved for operation. Test weights should be available at the site. All inspection and test results should be recorded in inspection and test logbooks on the job site. Records should include inspection dates, findings, and action taken. The crane should be completely inspected and tested before being put into initial operation. If you have suffered a serious personal injury or a loved one died as a result of a crane accident, a New York Personal Injury Lawyer at Gair, Gair, Conason, Rubinowitz, Bloom, Hershenhorn, Steigman & Mackauf can help you and your family recover compensation for the full measure of your damages. Please, Contact our firm to discuss your case.